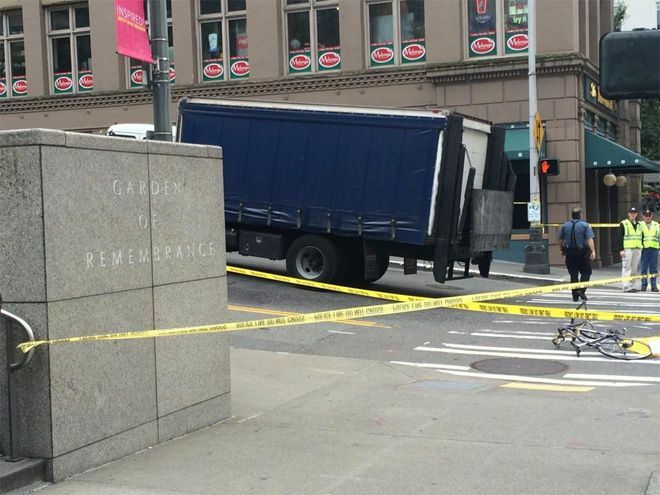 UPDATED: A prominent lawyer and civil rights advocate was tragically killed in a bicycle accident with a box truck near 2nd Avenue and University Street in downtown Seattle Friday morning. Seattle Police Department (SPD) officials identified the victim of the crash as 31-year-old Sher Kung, a prominent attorney who worked with the American Civil Liberties Union (ACLU) to overturn the U.S. military’s controversial “Don’t Ask, Don’t Tell” guidelines. Kung was part of the ACLU’s legal team that represented Major Margaret Witt, who was a well-respected flight nurse with the U.S. Air Force before being dismissed from duty as a result of her sexual orientation, according to ACLU Washington spokesman Doug Honig. The case resulted in Witt getting her job back and the military was forced to change its controversial policies regarding gay employees. SPD officials say the accident occurred while Kung was riding her bike southbound on Second Avenue in the bike lane running down the left-hand side of the street. A box truck was reportedly driving the same direction next to Kung in the adjacent left-hand lane and attempted to make a left-hand turn onto University Street. The truck allegedly turned left across the bike lane and struck Kung, who was pronounced dead at the scene of the collision. According to SPD Detective Patrick Michaud, the bicyclist appears to have had the right-of-way in this situation. Second Avenue has been a source of complaints for the Seattle bicycling community and traffic safety advocates for years. Sadly, the city was less than two weeks away from implementing significant safety improvements to the street, including a separate protected bike lane and traffic signal that are specifically designed to prevent this type of accident from happening in the first place. SPD officials say that the truck driver, who has not yet been identified, stayed at the scene and was cooperative with investigators. Officers are also reportedly investigating further to determine whether or not the bicyclist may have been in the truck’s blind spot at the time of the collision.